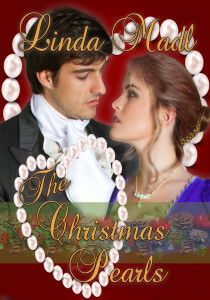 When the War of 1812 ended, privateer Captain Eli Whittaker decided to turn businessman and to wed for love and status. He’d already purchased the perfect gift for his bride, whom he’d yet to find—a string of luscious pearls. Then, the lovely Abigail Conway of the Boston Conways crossed his path. Love blossomed. Swiftly, he asked for her hand in marriage and selected the Freedom Inn at Christmastime as the setting for their wedding. His plan appeared flawless until Abigail arrived with her dour chaperone. Can he prove himself worthy of his bride to Abigail’s stern sister in a few days time? No way was Sara Larkfield, widow with an unsightly limp, going to allow her beautiful sister to wed anyone less than perfect— a privateer turned businessman hardly qualified. Then, the dashing captain greeted her with a smile and a bow. Her heart fluttered, in spite of her good intentions. How was she to know the former privateer would be handsome, charming, and insightful? Can Sara accept falling in love for the first time in her life and then letting him go? View more books in the genre "Holiday Stories".